You can probably tell by now that I do love sweet things! Anything with chocolate is sure to get my vote, but there is one dessert that I cannot get enough of, and that is tiramisu - I love it! This dreamy, creamy dessert has only come into my life in the last few years - the nearest thing I had to it when I was growing up was the sherry trifle that my Mum made! There are many variations of a tiramisu, the one I created recently had a mixture of rich mascarpone caramel cream and crunchy butterscotch chocolate, sandwiched between layers of light sponge soaked in coffee and Tia Maria, topped off with a good dusting of cocoa powder. And then, just because I could, I dribbled more caramel down the sides. This particular tiramisu had two purposes, the first one being my wedding anniversary, and the second one was for my very first entry into this months Sugar High Friday #32, which is being hosted by the Domestic Goddess. So I want to say a big thank you to my darling husband, because he's not that fond of my favourite dessert and to Jennifer for giving me another reason to make this gorgeous concoction, most of which was lovingly eaten by me. Make a sponge cake and spit in half horizontally. Whip up 284ml carton of double cream and lightly fold into 250g mascarpone cheese, along with some caramel. Place one half of the sponge into a spring form cake tin and dribble with a mixture of strong coffee and Tia Maria (taste to your liking). Sprinkle over half a bar of chopped Green & Blacks butterscotch chocolate. Spread mascarpone mixture on top and sprinkle with the rest of the chopped chocolate. Put the other half of sponge on top and dribble liberally with coffee/Tia Maria. Refrigerate for at least a couple of hours and when ready to serve, dust the top with cocoa powder and pour over some extra caramel. And if you don't have a husband like mine - you will probably have to hide it at the back of the fridge. I think we have strangely similar tastes - I love chocolate and chilli, but tiramisu is my absolute favourite desert. Hi Catherine! Thanks for your nice comments. I was thinking the same things when I read your blog about similar tastes! Who couldn't love chocolate and chillies? Great dessert. 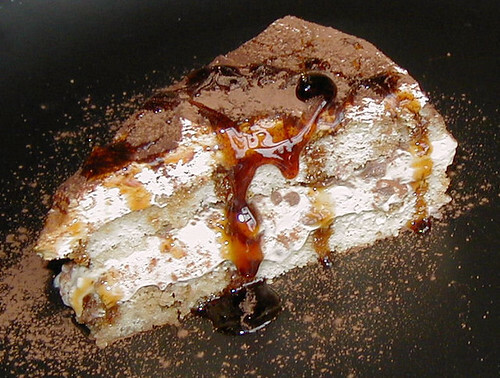 Love Tiramisu and this version looks great! My goodness that looks soooo good!! Thanks for the comment you left on my blog. This is my first visit and I'm not sure why I haven't "discovered" your blog before, it looks fabulous! Your pictures are amazing! Hello Helen, thanks for your kind comments and for stopping by. I'm glad to see so many Tiramisu lovers around! Hi there Janet - thank you also for your lovely comments. I am fairly new to blogging and still learning 'the ropes'!